STORRS - Olivia Nelson-Ododa’s second sport in high school was volleyball. 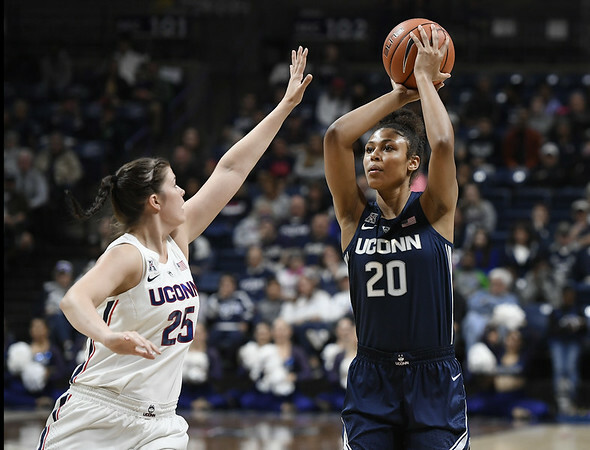 But with three weeks of practice with coach Geno Auriemma and the UConn women’s basketball team under her belt, the freshman forward feels like she’s getting ready for track season. “This is the most I’ve ever run before in my life,” Nelson-Ododa said with a smile. “It’s such a quicker pace than anything I’ve been used to,” Nelson-Ododa said. “The college pace is high speed, uptempo, and you have to think really quickly. With the second-ranked Huskies short on size, the learning curve for Nelson-Ododa is sharp. The 6-foot-4 native of Winder, Georgia, averaged 19.5 points, 15.9 rebounds, and 5.2 blocked shots in earning McDonald’s All-America honors as a senior at Winder Barrow High. During the summer she represented her country at the FIBA U-18 Americas Championship and averaged 9.2 points on 50.0 percent shooting from the floor, 4.5 rebounds, and 1.0 blocked shots in 16.5 minutes as Team USA won the gold medal. She lists former UConn star, two-time Olympic gold medalist, and fellow Georgia native Maya Moore as her favorite player. As it is for many post players coming into college, progress comes slowly and Nelson-Ododa is taking it one step at a time. “One thing I think I’ve improved on is the way that I see the court,” Nelson-Ododa said. “Then there are all the little details that Coach Auriemma is always picking on. He always emphasizes the little things. Fortunately for Nelson-Ododa, her older teammates know exactly what she’s going through. They were freshmen here at one time, too. Samuelson’s “them” includes the Huskies’ second freshman, guard Christyn Williams. Nelson-Ododa and Williams are roommates and are their own mini-support group as they transition to college on and off the court. Of course, Nelson-Ododa can also call home for advice. Her father, Sebastian, played basketball at Huntington University and for the Kenyan national team. Her brother, Alonzo, played at the University of Richmond and one year at the University of Pittsburgh as a graduate transfer. Her sister-in-law, Dearica Hamby, was a first-round draft pick after an outstanding career at Wake Forest and plays for the WNBA’s Las Vegas Aces. “I think the adjustment is going well,” Nelson-Ododa said. UConn plays the first of its two exhibition games Sunday against NAIA Vanguard University at Gampel Pavilion (1 p.m.). The Huskies’ regular season opener is a week later when they host Ohio State at the XL Center (noon). Posted in New Britain Herald, UConn on Thursday, 1 November 2018 20:53. Updated: Thursday, 1 November 2018 20:56.